Peace, Love, Hope and Joy--all your wishes for the season! A festive holiday accent, the design forms the words Peace, Love, Hope and Joy. 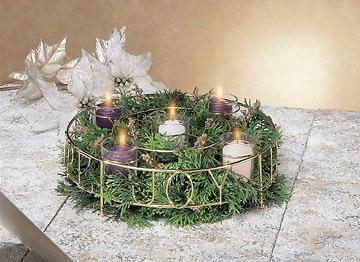 Made of heavy wire, with glass votive candle cups, and an empty center design that can be filled with the customer's own greenery or flowers. Five votive candles and ceremony pamphlet included. Corrugated box. Measures 12 1/4 dia. x 3 high. Also available in black wire. Extra candles are available. (Set of five: three purple, one pink, and one white).